Citation: C N Trueman "The Wyatt Rebellion of 1554"
The fear of England becoming re-Catholicised combined with the proposed marriage between Mary and Philip of Spain, led to the Wyatt Rebellion of 1554. This was a rebellion led by nobles – principally Sir Thomas Wyatt from Kent, Sir Peter Carew from Devon, Sir James Croft from Herefordshire and the Duke of Suffolk from Leicestershire. However, it had one major weakness – it did not have the popular support of the people across the land and was doomed to failure. There were those in England who opposed Mary’s staunch Catholicism and who feared the return of Papal authority in England and Wales. These men were equally alarmed by Mary’s proposed marriage to Philip of Spain, as they feared that this would lead to Spain having an undue influence on English politics. France who could not countenance a Habsburg king of England, with all that it might entail, shared this fear. With the Holy Roman Empire to the east and with Habsburg Spain on her southwest border, the last thing France wanted was an extension of Habsburg influence across the Channel. After her coronation on October 1st 1553, Mary quickly placed Catholics in posts of responsibility, including increasing the numbers in the Privy Council to 43. The Privy Council was the most important body in government and the senior nobles in it had easy access to the Queen. The plan itself involved too many ‘ifs’ and ‘buts’ if it was to succeed. 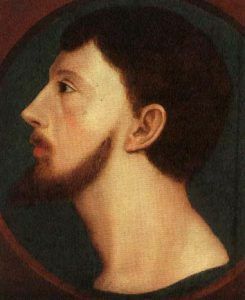 The noble conspirators planned to remove Mary, instate Elizabeth as Queen and arrange for her to marry Edward Courtenay – a man Mary had already rejected as a husband. The plan was for three rebellions to take place in separate parts of the country. They would occur at the same time – in the Midlands, the West Country and Kent. The plan was that the government would not know which one to put down first and each would blossom as a result of their localised success and attract more and more supporters among the common people. The French Navy would blockade the English Channel with eighty ships so that the Habsburgs would not be able to help Mary. The plan failed miserably. The Imperial Ambassador, Simon Renard, had heard rumours that such a plot existed and informed the Lord Chancellor, Stephen Gardner, of his concerns. Gardner brought in Courtenay for questioning as Renard had mentioned his name. The records stated that Gardner’s questioning was ‘robust’ and Courtenay was not a man who could stand up to this. Edward Courtenay told Gardner all that he knew about the plot so that the government knew about the plot even before it had begun – even if Courtenay would not have known about the details. The ‘uprisings’ in the Midlands and the West Country were a failure as few of the people there gave Carew and the Duke of Suffolk the support they needed for success. It seems that though there was concern about Mary marrying a foreigner, loyalty to the Queen took precedence. Those in the Midlands did not want to commit treason (Suffolk raised a force of just 140 men) while many in the West were Catholic. Wyatt succeeded in raising an army in Kent of about 4,000 men and his proximity to London greatly worried the government there. A force led by the Duke of Norfolk was sent to deal with Wyatt but this collapsed when Wyatt was helped when 500 government troops deserted to his cause. Norfolk and what was left of his force retreated to London. There can be little doubt that there were those outside of noble circles who were gravely concerned by the thought of Mary marrying Philip and it was these people who joined Wyatt. At a trial held after the rebellion had failed, one rebel is recorded t have stated that the rebellion was “to prevent us from over-running with strangers”. However, Wyatt delayed his advance on London and gave the city time to organise its defences. His attempts to cross the River Thames near to the Tower were thwarted as the bridges had been deliberately damaged to stop this. Wyatt marched to the southwest of London and crossed the Thames there. He marched his men to what is now Hyde Park Corner and made for the City. To get into the City, Wyatt had planned to get in via Ludgate. However, the gate was heavily fortified and to get to it, the rebels had to move up narrow streets (via the Stand and Fleet Street). By using these narrow streets, Wyatt left his men open to being trapped by armed Londoners loyal to Mary. This is what happened and he was defeated. Wyatt was sent to the Tower of London, as were the other noblemen who were caught. Their guilt was obvious. Those rebels who were not killed were arrested. In fact, so many were caught that the authorities had nowhere to put them (in terms of prison space) and had to use local churches. Mary ordered that the offenders should be harshly dealt with. However, not all of her advisors shared this view. Mary listened to those advisors who suggested that leniency for the rebels would be the best way forward and would demonstrate her true Christian nature. She was told that this would raise her status still further in the eyes of the people. Only two of the leaders were executed for their treason – Wyatt and the Duke of Suffolk. Other minor nobles were also executed but some – guilty of treason – were spared. In total about 90 rebels were executed but many of the common people who had joined Wyatt and survived were spared. Two other casualties were Lady Jane Grey and her husband Guildford Dudley. Both had been in prison since the failed attempt to put Lady Jane on the throne and had nothing to do with Wyatt’s rebellion. However Mary felt that she could no longer risk anyone rallying to Lady Jane’s cause – hence her execution – especially as her father, the Duke of Suffolk, had been involved in this plot and had been executed for treason. It is thought that Wyatt was tortured so that he would admit that Princess Elizabeth was involved in the rebellion. This he refused to admit to and he made it clear on the scaffold just before he was executed that she was innocent of any involvement in the rebellion. When a government official at the execution tried to contradict Wyatt’s statement, the people who had gathered at Tower Hill greeted his comments with anger as the final words of a condemned man were always seen as being truthful. Princess Elizabeth was briefly imprisoned in the Tower but was quickly released. Did the rebellion have any chance of success? The rebellion started in the worst month in terms of weather – January – though it had been planned to start in March. The roads they planned to use to transport both men and equipment had become unusable due to the rain. Carriages carrying equipment from Kent to London lost their wheels on route to the city and the rebels had to leave behind equipment that might have helped them in London. Wyatt’s route into London was also fraught with difficulties for an attacking force. The roads in the City were narrow and made it very easy for a relatively small force to defend the imposing gates that surrounded the old City. If Wyatt and his men could not get through these gates, he would not have been able to get into the city itself. Therefore, the heart of government – capturing it was his goal – was safe. Another major weakness of the plot was the fact that it required all three uprisings to succeed if the authorities were going to be split in terms of where to deploy the military. If one failed, this became less of an issue for the government; if two failed, then the success of the rebellion rested on just one of the three uprisings. Secrecy was also a major issue in explaining the rebel’s failure. So many nobles were involved that leakages were almost certain – and this is what happened. While Gardner may not have been able to control events, he knew what was going to occur and could plan accordingly – hence the deliberate destruction of the bridges over the Thames near the City; hence the deployment of troops at Ludgate. The only thing Gardner failed to succeed in was his efforts to get Wyatt to admit that Elizabeth was involved.